Hubert Crouch is a graduate of Phillips Andover Academy, Vanderbilt University, and Southern Methodist University School of Law. He is a practicing trial lawyer with over thirty-five years of experience in the courtroom. In addition to practicing law, he has taught Free Speech and the First Amendment and Legal Advocacy to undergraduates at Southern Methodist University and was awarded the Rotunda Outstanding Professor Award. An avid rock and roll fan, he has played guitar in a Sixties "cover" band for over thirty years. He and his wife split their time between their home in Nashville and their mountain retreat near Sewanee, Tennessee. Young journalist Leah Rosen, working for the premier Texas magazine in Austin, has uncovered proof that legendary Fort Worth trial lawyer Cal Connors has used false evidence and testimony to win some of the biggest court cases in recent history. As Leah tries to leave no stone unturned before publishing her story, threats to her become increasingly dangerous as she gets too close to the truth. Meanwhile, in the town of Hagstrom, Texas, parents on their way to bury their veteran daughter come face to face with a group of extremist Christians protesting the woman's service in the military. Attorney Jace Forman is called in to file a lawsuit against the group, exploring the limits of the First Amendment. In both cases, private investigator Jackie McLaughlin is hired to hunt down people and information for both Rosen and Forman, for whom the stakes are getting increasingly higher. 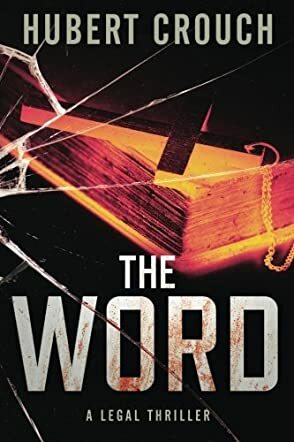 Hubert Crouch's The Word will keep readers immersed from start to finish in a world where justice always comes with a heavy price tag. Be ready for a wild ride! In The Word, real life attorney Hubert Crouch provides masterfully connected, multiple story lines that could have been ripped straight from the headlines. Corruption, greed, and danger criss-cross with the pursuit of honesty and truth for a page-turning, action packed story. Though this is book two in the Jace Forman series, it absolutely stands alone, though I fully intend to read book one. Crouch is in his element as the courtroom drama unfolds, writing memorable and unique characters -- all with a Texas flair -- for readers to love or loathe. The writing is high caliber and the story is engaging and realistic, with memorable characters. Top notch. What a thrill! Loved it from start to finish! Good cops! Good Lawyers! Bad Cops! Bad Lawyers! Could not put it down from start to finish! Ready for the third in the series! The Entire book was fantastic! It iss the kind of read that I so much like!